Melissa Boyce was raised in a musical household. She began playing the trumpet while growing up in Nanaimo, B.C and developed her talent as a vocalist in Toronto, which she now calls home. With a jazz pianist father, Melissa developed a keen appreciation for a wide variety of music. 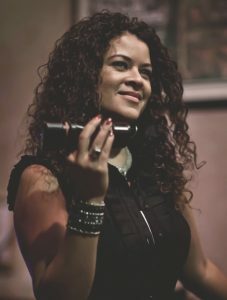 Her music influences range from: Ella Fitzgerald, Sarah Vaughan and Dinah Washington, to Stevie Wonder, Sergio Mendes and Herbie Hancock… and of course, her dad Norbert Boyce. She has made featured appearances at the most notable clubs in and around Toronto including Monarchs Pub (The Eaton Chelsea Hotel), The Royal York, The Gibson Centre, Homesmith Bar (The Old Mill), The Montréal Bistro and Jazz Club, Top of the Senator, The Bamboo, Liberty Grand, Trane Studio, Healeys (with Jeff Healey) The Rex Hotel, and Ottawa’s Fairmont Chateau Laurier. She has also performed at The Kingston Jazz Festival, TD Toronto Jazz Festival, the Distillery Jazz Festival, The Royal Botanical Gardens Summer Jazz series, and the Roselawn Jazz Series. Melissa has sung for many dignitaries including the Prime Minister of Canada, Supreme Court Judges and Provincial Chiefs of Police. Most recently, Melissa has begun a successful foray into the Chicago jazz scene, being featured with the Jimmy Ellis Quartet. While her live shows are primarily loyal to the jazz genre, she has also become known for surprising her audiences with inspired interpretations of current R&B, soul and pop music. Melissa has been expertly accompanied by some of Toronto’s finest jazz musicians including: Kevin Laliberté, Drew Birston, Kevin Barrett, Jordon O’Connor, Bernie Senensky, Reg Schwager, Nathan Hiltz, Artie Roth, Ted Quinlan and Ron Davis, to name a few. Melissa’s debut CD “Teach Me Tonight” enjoys consistent radio play on many Canadian jazz stations. Featured musicians include Kevin Laliberté on guitar, Drew Birston on bass, Davide Direnzo on percussion and Norbert Boyce on keyboard. Their remarkable chemistry blend together to create soulful blues, sensuous Latin adaptations and warm traditional jazz. Melissa’s voice gives an affectionate, textural and adventurous interpretation to the best-recognized and most beloved jazz standards in the world.